"Of course." The formless being spoke. "What?!" Sol's yell echoed into the darkness. The omnipotent voice once again fell into silence. "Then what does this mean? I won't be able to regain my memories of my previous lives?" Sol frowned at the name. Then he felt a warmth all around him. He began to take shape. He grew arms and legs, his hair began to flow down his back. His eyes opened and showed a beautiful piercing orange. "Eww. I'm a redhead this time?" "Oh god, no! I still have bruises from all the fangirls!" Sol shivered and rubbed his arms. Then he closed his eyes, becoming serious once again. "So I'll lose my memories and abilities again. Just like every other time." With a sigh, he looked up into the nothingness. "I'm ready." In a swirl of darkness and a burst of light, Sol was gone. Many months had passed since Sol was born into the world of Vescrutia. And now, through the same way he came, he would exit. For now, her retained his form as the redhead that had entered Vescrutia. He stood in the endless plain, outside of Vescrutia's hell and the road to eternal slumber. He could see it from there, but it was only a small line far below him. With a sigh he turned from the latest reality that he had called home so briefly and the memories that had come with it. "I'm going to miss you Yuki, Shiro, Kyo. I hope you all take care of yourselves." Sol began to walk on the faintly glowing path that lead higher into nothingness. "You are early, Sol. Why have you abandoned this world?" The omnipotent voice asked as Sol's hair began to turn white, losing its color. "This world did not need me. For salvation nor for destruction. There was plenty of it everywhere. Besides, be it to rise the world or to destroy it, I believe that the decision will not fall to the current leaders of the world, nor to my judgment alone. It will fall onto the next generation, the new breed of shinobi that will rise in the world of Vescrutia. The time for change is upon them, sooner than they know it. I don't have a part in that...but Kyo..."
The omnipotent voice remained silent. Sol's clothing had lost its color in his small explanation, and now his body began to glow in its pure white visage. "You have grown, Sol. Never did we expect you to leave a world to its own fate. Your death was premature, yet the consequences of your actions are minor. Are you sure this is the wisest decision for the Kusanagi that you have cursed though?" Sol chuckled. He slowed as a door of light appeared several yards ahead of him. "Funny how that works. I believe that my curse will be one of his greatest strengths. He is someone who has seen light and darkness, has experienced good and bad and has dealt in both of them. If anyone can carry my burden its him." "You put so much faith in this man. Why?" Sol stopped right in front of the door to the omniverse. Before his body became overwhelmed in the light that would forever take his existence from the world of Vescrutia, he looked back on the world. "Vescrutia...no matter the enemies that may come forth, be them past friend or only foe, never let the light or darkness of your hearts take away what truly matters. The bonds that you have with another or even yourselves hold the true strength that will lead you all towards tomorrow. Never lose sight of what you wish to achieve be it salvation or destruction. Move forward to the future and never let anyone stop you." His gaze fell upon Kyo as his being spoke out to the world of Vescrutia as a whole. "Never lose sight of yourself." With a swift turn, Sol's body became light, shining brightly in the surreal reality before the light was overrun by a door of darkness slamming itself shut, and also pulling the curtain on the life that was once Sol Arcanza. -Sol Arcanza Chapter 8, End. Once more, the omnipotent voice spoke to the formless being of Sol in the infinite reaches of eternity. The shapeless being of Sol seemed to glow with a radiant happiness, never seen before during his travels between dimensions and universes. "Why do you sound so sad about it? Aww, are you starting to miss me while I'm gone?" "But you can feel emotions right?" Sol prodded. "...Wait, can you really feel emotions?" If he could, Sol would have sweat dropped. "You just changed the subject..."
"Keyblade...wait, so I can see Xion again?" Sol's excitement was shown by the flare of light and darkness that surrounded his forming body. Sol's body finally finished forming. A dark blue hoody covered his dark skinned torso while a silky mop of white hair sat atop his head. "Wait, this is the same form I took last time I was with the Organization..."
'Sol? Are you alright?' The voice asked. "...I'm sorry. I...I just want to get going now. I'll do things right this time. 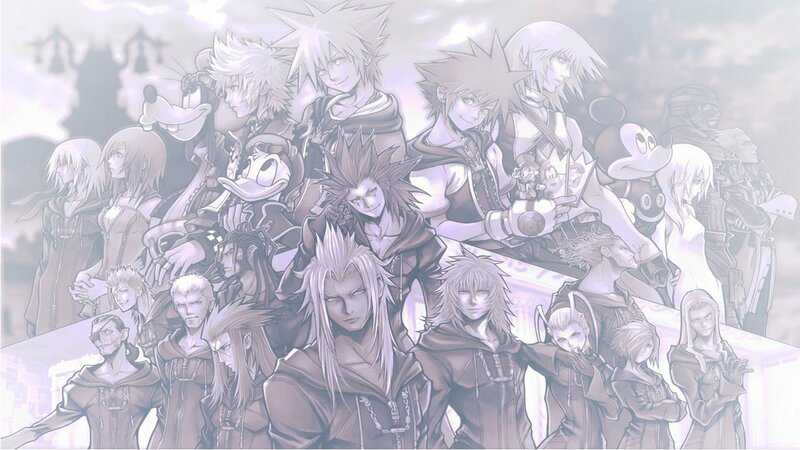 I'll save Xion, and Roxas. Axel too. I don't want to lose anyone..."
With a sigh, Sol turned away, the next door to universe opening in the shape of a keyhole. It brought a nostalgic smile to his face. "It's alright. I only have hope. Even though I know I'm going to lose my memories again, I want to at least try. That's all I can do..."
Knowing those would be the final words he would hear from them until he died once more, Sol prepared to take his first step into this new world. "...!" Sol was speechless. That had definitely never happened before. With renewed confidence and vigor, Sol's aura expanded around him and beautiful swirl of auroran colors. "See ya soon!" Sol called before finally vanishing into the light of the keyhole. A white bolt of lightning hit the ground dead in the center of town, leaving a blazing imprint of a keyhole on the ground, glowing white but surrounded by darkness. Nothing in the area was affected by the imprint, however, Sol himself would be overwhelmed by the sudden rush of power and lose of memory. As soon as he was aware of his situation, he immediately lost his cool. "RAAAAAGH!" The light of the keyhole around him faded black, the power of darkness radiating from it heavily. His one visible eye that wasn't covered by his hair shined purple. Going into a feral crouch, Sol made two blades of darkness appear in his hands, the ground rumbling from the surging darkness around him. Sayuri had been sent to Traverse Town on a recon mission. She hadn't done one of those in a while. She was glad to be able to get out of the castle for a bit, the only bad part was that she was alone. Since it was a recon, and she wasn't new anymore, she was able to go off on her own during these missions. The girl would've obviously preferred to go with Akiharo, since the two of them needed to stick together. Of course that might've been the reason why they were sent off on different missions. They couldn't plot anything if they were separated. Not that they actually would, when they were on missions, everything was about the missions, no one would think of anything else. They knew what needed to be done and it would be done as quickly as possible. Luxord sure as hell wasn't going to take that risk though, was he? Sayuri sighed, exiting the Dark Corridor that had taken her to Traverse Town. She stretched her arms over her head and suddenly froze in that position, her eyes looking off in the distance intently and narrowing. Something was wrong. Not even two seconds in the town and there was already trouble. This was weird though, the energy. Wasn't anything she'd encountered before. Was it a new heartless she hadn't faced before? The energy was dark she knew that. Maybe it was a new heartless.. what if it was the Heartless leader, Hitamé? She had to find out. Without much thought, Sayuri took off running in the direction of the energy, summoning her keyblade quickly as she ran. 'Where...where am I? What am I doing?' Sol's voice echoed in his mind only. He thought he was speaking but no sound was made. 'Anyone...what's going on? Someone answer me!!' He yelled in his mind as he looked around at the terrified faces of the inhabitants of Traverse Town. Why wouldn't the answer him. 'ANSWER ME DAMMIT!' Sol dashed forward towards the nearest building, the dark keyhole behind him sealing itself shut and disappearing. As soon as he left the darkness, however, his mind cleared up a bit. It was already too late though as his momentum wouldn't let him stop. His thrust pierced into the side of a building and darkness pulsated from the blade. A large hole in the shape of a keyhole was blown in the wall, fulminating with darkness. As Sayuri ran toward the energy, there was a sudden rush of energy that ran through her and pulsated in the surrounding area. The energy surge made her stop in her tracks and she stood where she was, staring off in the direction where the surge had come from. Something wasn't right, it just seriously wasn't. She had thought it was a Heartless at first, but no matter how strong one was, there was no way a Heartless was at the center of this energy. It had to be a person. But who? This energy was stronger than anyone else's. It was stronger than her energy, that much was for sure. It was stronger than Xemnas' energy. And.. it was stronger than Akiharo's energy. When he was being controlled by the darkness inside of him. If this energy was stronger than Akiharo when the darkness was in control, then everyone was in trouble. It was a lot of work to keep Akiharo under control when he was being consumed by the darkness, what about this? This was something worse, the energy was stronger, and she doubted anyone knew how to control whoever it was that held this energy within them. The Nobody shook her head quickly and felt her grip on her keyblade tighten. She was anxious, for some reason, to find out who this person was. She smirked and looked up. "Getting restless, aren't we Akira?" she asked, as if her Somebody would respond back. Of course she wouldn't but Sayuri knew that the anxious feeling she had was a result of Akira's personality. The girl could never sit still, which explained why she was the way she was sometimes. "Right. Well then, we'd better not be kept waiting any longer." Sayuri said, and she ran forward, heading toward the energy again. Who could be the cause of this? I know it isn't Akiharo. The energy is way too different, I know Akiharo's energy. I'd know it anywhere. This energy is totally different, it can't be anyone I know. There has to be someone new here. As she approached the energy, the girl was taken by surprise when she saw a gaping hole in the shape of a keyhole in a wall. A.. A keyhole..? She looked down at her keyblade and then searched for the person who had made the hole. Her eyes settled on a boy she hadn't seen before. The energy of the aura around him matched that energy she had felt before. This was who she was looking for. Sol's flaring energy would fade completely once his senses completely came back to him. Though the confusion that he held didn't waiver, his awareness of his own being did. 'This isn't right...' He instantly thought as the dark blades within his grasp slowly faded as well. He held his head in pain, trying and hoping to remember something, anything at all. However, the best he got was flashes of a hooded figure, reaching out towards him. Dropping to his knees, he felt a familiar power, even still he didn't know why it was familiar. "Key...blade?" His voice was strained as the more he tried to remember, the less sense any of it made. Nevertheless, the familiar presence was nearby.